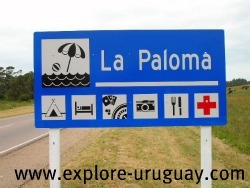 La Paloma Uruguay is a quaint seaside village with less than 5,000 residents. However, when the summer tourists arrive, this number is greatly increased. A popular area for Uruguay tourism, the village is approximately 240 kilometers from Montevideo and 160 kilometers from Chuy. 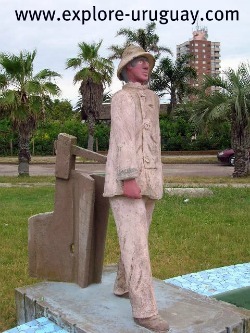 the old sailors who were typically fishermen. They would see a shape that resembled a pigeon or a bird which are often created by the rocks and wave along the coast, and generally the area in which it was seen would be a good fishing spot. The port of La Paloma Uruguay was constructed in 1910 and is today one of the country's main fishing ports. An abundance of fresh seafood is always a choice at nearly every restaurant within the village. The downtown area of La Paloma is not large, but it has all the amenities sought by visitors. The main street is Solari Avenue and here you will find a number of stores, crafts market, a casino and cinemas. There are also schools, a fire department, police department and a cultural center. This street is accessed by Avenida del Navio (Ship's Avenue) and it also brings visitors to the Grande and the Chica bays. They are off the shores of La Tuna Island. The Hotel Cabo de Santa Maria, which is a favorite destination of many who enjoy Uruguay tourism, is also located on Solari Avenue. For visitors, the streets of La Paloma will carry them to the sea where the historical lighthouse watches over the coast. The buildings here are the original homes of the first people who lived here and are often rented during the tourist season. There are many dating back to the founding of La Paloma Uruguay and have been preserved as part of the heritage of this area. The beaches are diverse and can provide a serene spot for swimming or if surfing is an activity enjoyed, Los Botes, El Cabito and La Balconada can provide the wave action desired. Both choices will allow visitors to enjoy the beaches whether it is the summer season or the winter season. Uruguay tourism in the summer months brings the crowds and during the winter season, the beauty can be enjoyed in solitude. A long stroll along Los Botes is often enjoyed by tourists and residents alike. For a romantic sunset, La Balconada provides the best in the world. If a get-a-way is what you have in mind, La Paloma, Uruguay is the choice that will provide the solitude or the laid-back atmosphere that is desired. The woods that surround the village are also a great place to enjoy a stroll through the pine trees and the relaxation provided by the sounds and sights. Only a few minutes from La Paloma, is a resort often called A balcony overlooking the sea. La Pedrera, which is actually located on a cove, is also enjoyed many who come to visit the village of La Paloma. The village houses located here were built as far back as 1898. The area is a fisherman's paradise with nets catching a variety of sharks, silversides, sole, grouper, white croakers and black drums. 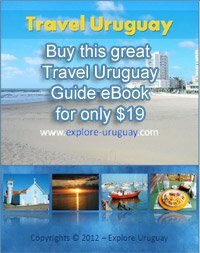 Uruguay tourism provides a variety of activities for thousands each year. The mixture of the historic and the modern are a perfect blend, allowing visitors the diversity they are seeking.